The city of Ise is home to Shintō's most sacred shrine, the Grand Shrine. Shintō is more than distinctively Japanese, it largely defines Japanese culture and tradition. Japan's earliest "histories", really collections of myths and legends, describe how early deities created Japan and the rest of the universe. Locations around Ise are deeply involved in these legends. This is where the universe was created, and where the deities now live. Or so the story goes. The kami are the deities or spirits of Shintō, with the earliest ones creating the universe and the other kami. Ise is known by a title that roughly means "The Holy City" but more literally means "The Capital of the Kami". I had been to Japan before. I feel like I can understand Buddhism to some extent, but Shintō remained mysterious. I did know that it was a key part of Japanese culture. So, I went to Ise. Do I now understand Shintō? No, of course not. But I better understand Japan. Ise is in Mie Prefecture at the eastern tip of the Kii Peninsula. It's south of Nagoya and southeast of Kyōto and Osaka. I had flown to Tōkyō and stayed there for a few days. Then I went to Ise. I started by taking the subway and elevated trains to Tōkyō Station. 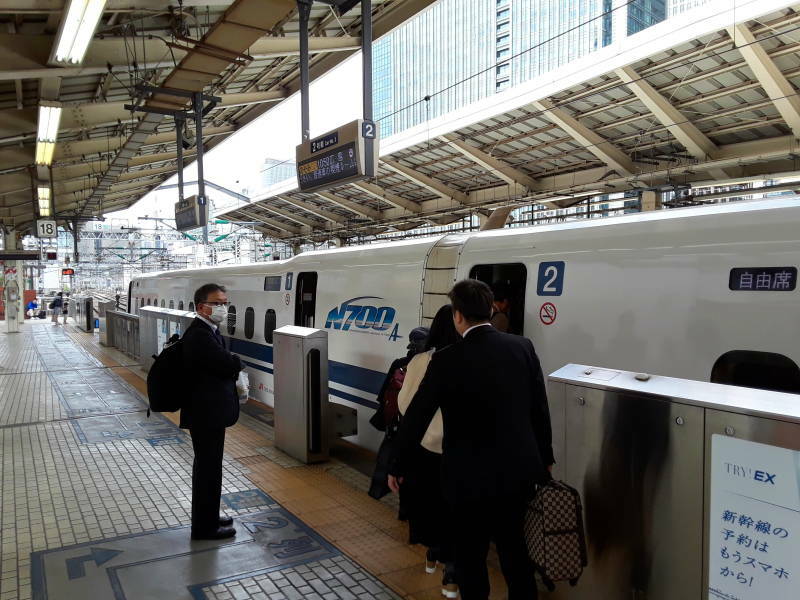 You can get train passes for unlimited travel for one or two weeks, if you plan ahead and purchase them before arriving in Japan. However, they only make sense if you're only there for a week or two and traveling between major cities on most days. I was there for about four weeks, staying in each place for three or for days before moving on. 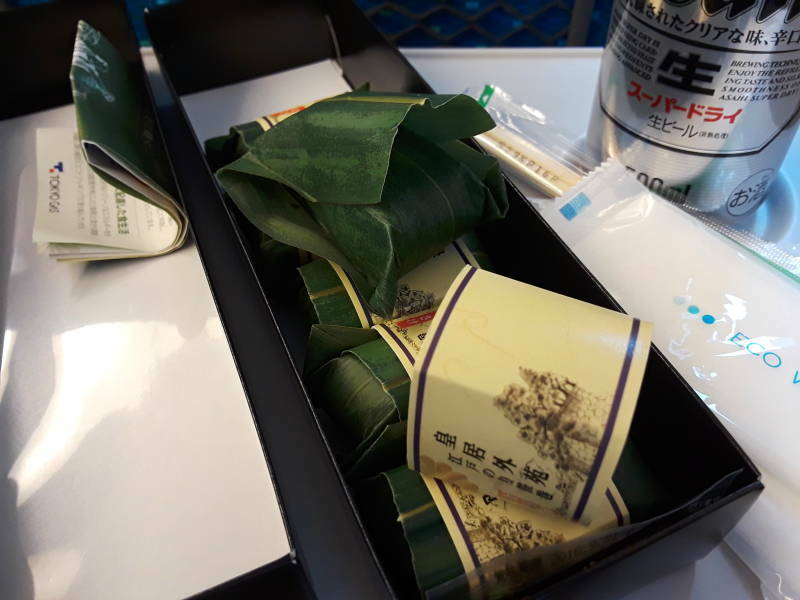 I bought a ticket to Nagoya on the Shinkansen, the wonderful "bullet train". 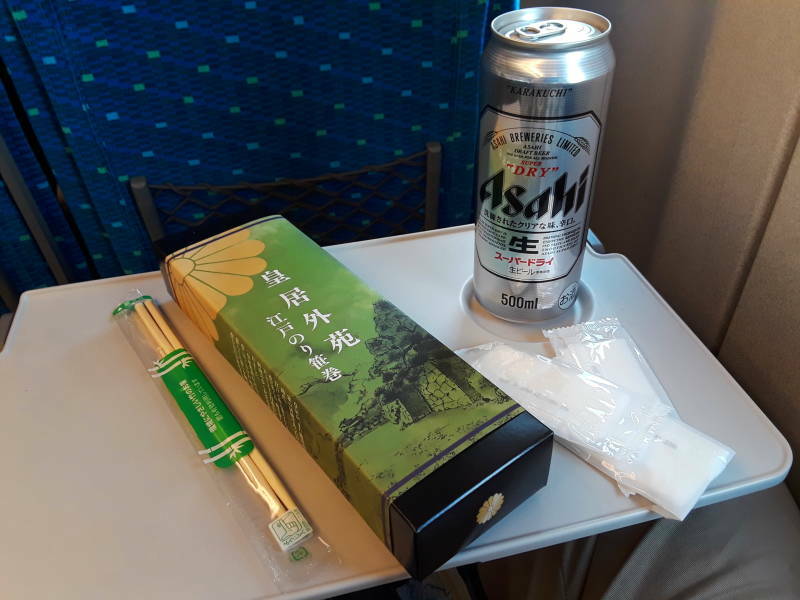 The ticket cost ¥10,360 or about US$ 96 for the trip of almost two hours from Tōkyō to Nagoya. For comparison, Amtrak's Acela, the nicest train in the U.S., takes about 3 hours to cover the 360 kilometers between New York and Washington, and costs about US$ 175. 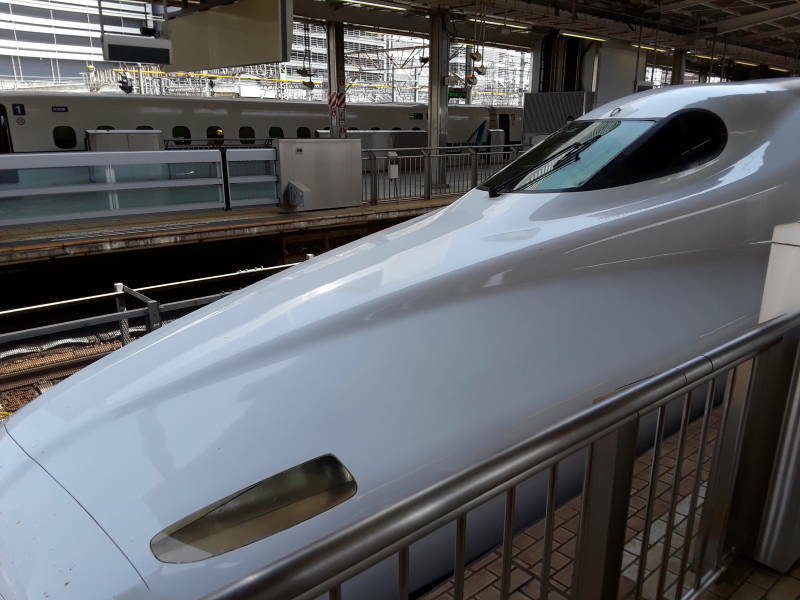 The N700 series Shinkansen, like the train I rode on this segment, has a maximum operating speed of 300 km/hour. 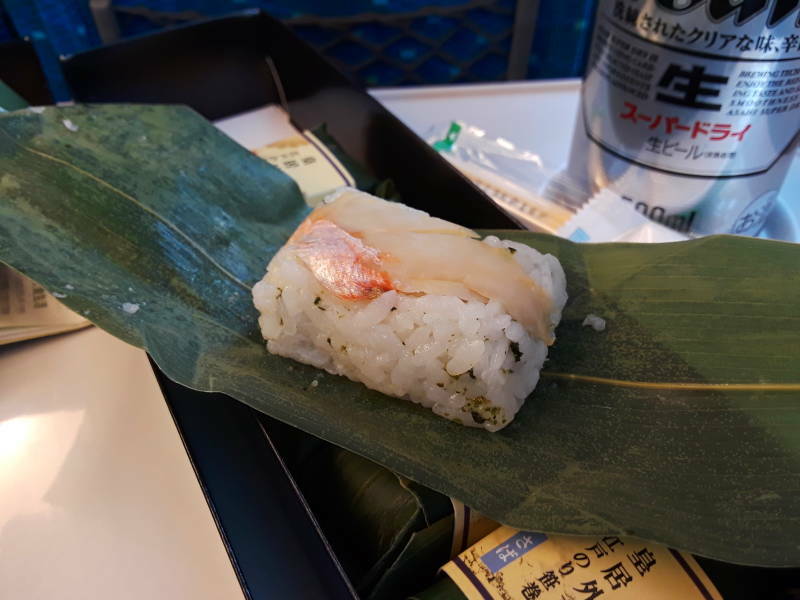 This train was bound for Hiroshima. The first two stops were in Shinagawa and Shin-Yokohama, within the greater Tōkyō area. The next stop was Nagoya. Most stations have a wide range of food and drink available to purchase and take on the train. Meanwhile we're moving southwest at 270 km/hour or faster. The top-to-bottom transfer of the imaging plane in my Android phone's camera is obvious when we're moving that fast past nearby objects. 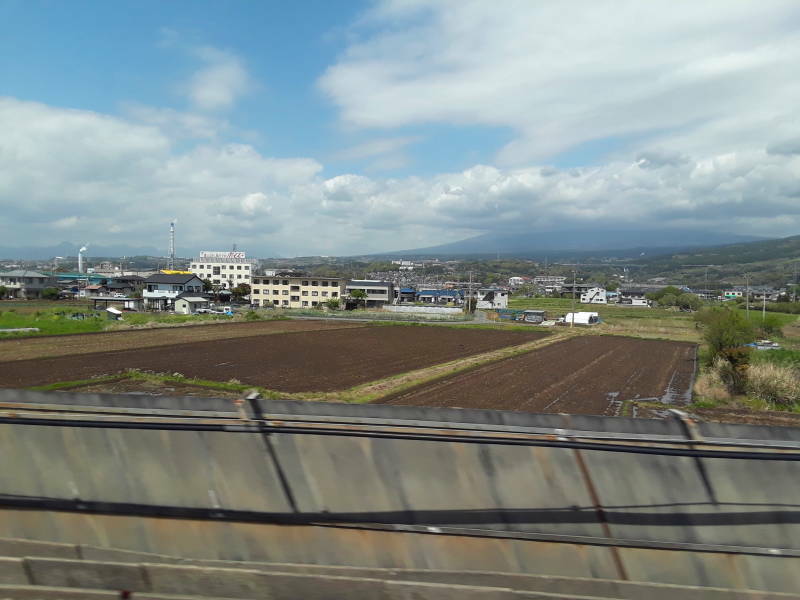 The peak of Fuji-san or Mount Fuji is hidden in the clouds. 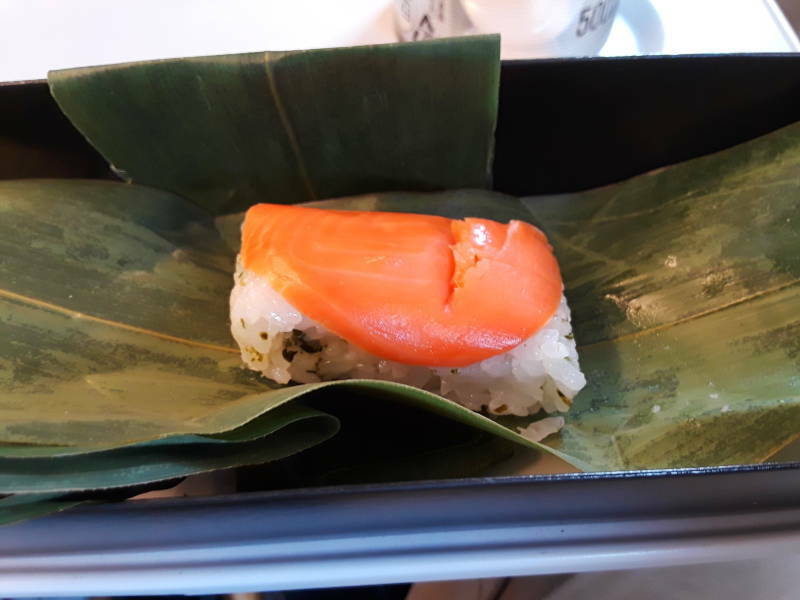 I have my lunch as we zoom along. Six pieces, each a different type of fish. Soon we're in Nagoya. 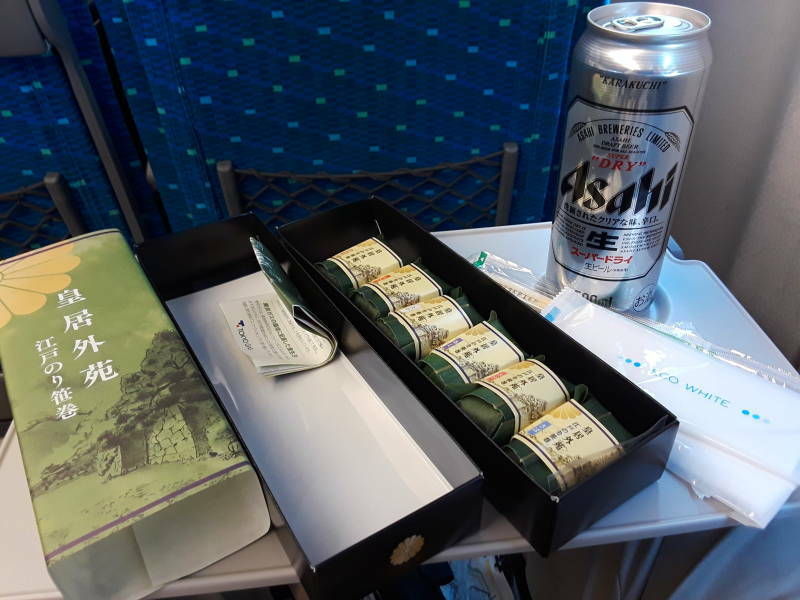 You must pay attention when you ride the Shinkansen. The train usually stops for just over one minute at each station. Here's the front of my train, getting ready to pull out of the station. 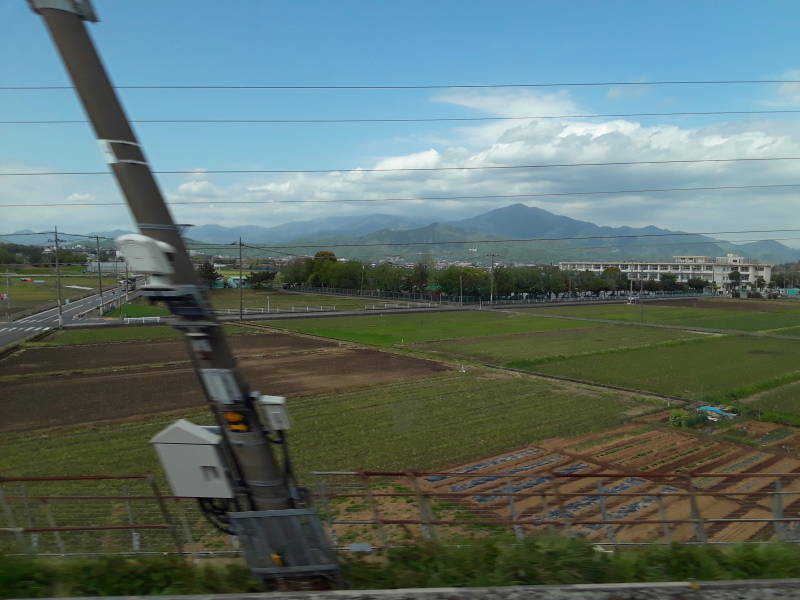 There goes the tail end of my train, onward through Kyōto and Osaka toward Hiroshima. Another is briefly stopped at the next platform. Large high-speed trains arrive and depart every few minutes at major stations. At Nagoya I bought an onward ticket on the JR Line to Ise-shi, the main station at the center of Ise. My Express train onward to Ise cost ¥2,000 or about US$ 19, and took about an hour and 40 minutes to cover about 130 kilometers. Compare that to Amtrak between Chicago and where I live in Lafayette. That costs US$ 24–38 depending on the time of year and day of the week, and takes up to 3 hours to cover about 200 kilometers. And there's just one train a day, not one or two every hour. 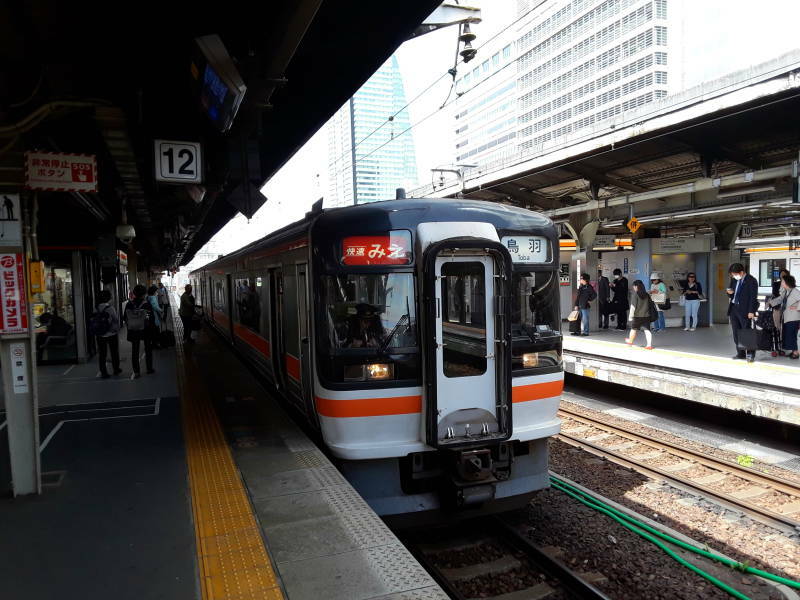 This train shows みえ or Mie on the white-on-orange placard. Ise is in Mie Prefecture. Toba, shown in kanji and romanji on the black-on-white placard, is the end destination. It's just beyond Ise, at the tip of the Kii Peninsula. Go ahead, learn to pronounce katakana and hiragana, how hard could that possibly be? As I'll show you on the next page, it can be very handy. But good luck with the thousands and thousands of kanji, many of them quite complex. 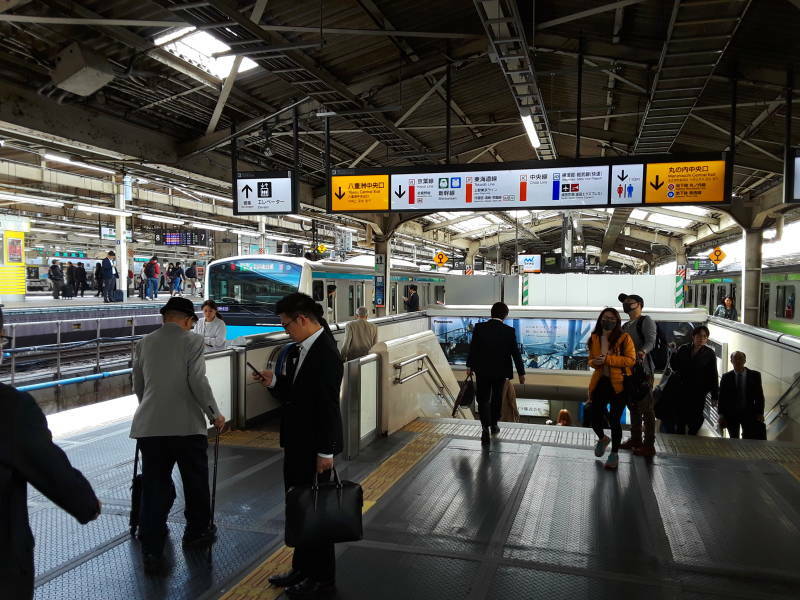 Good news: the electronic signboards at stations cycle through Japanese and romanji. 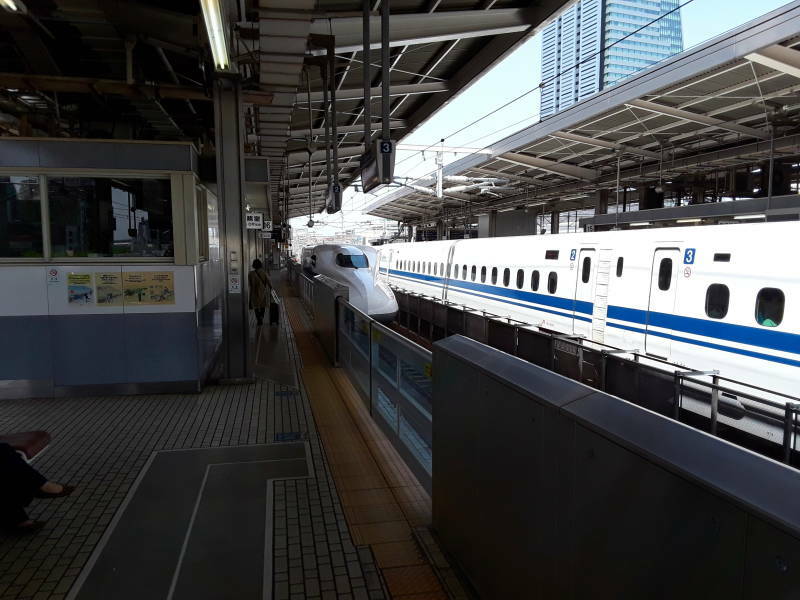 This is an Express train, but it travels nowhere near as fast as the Shinkansen. These move at maybe 100 to 160 km/hour. 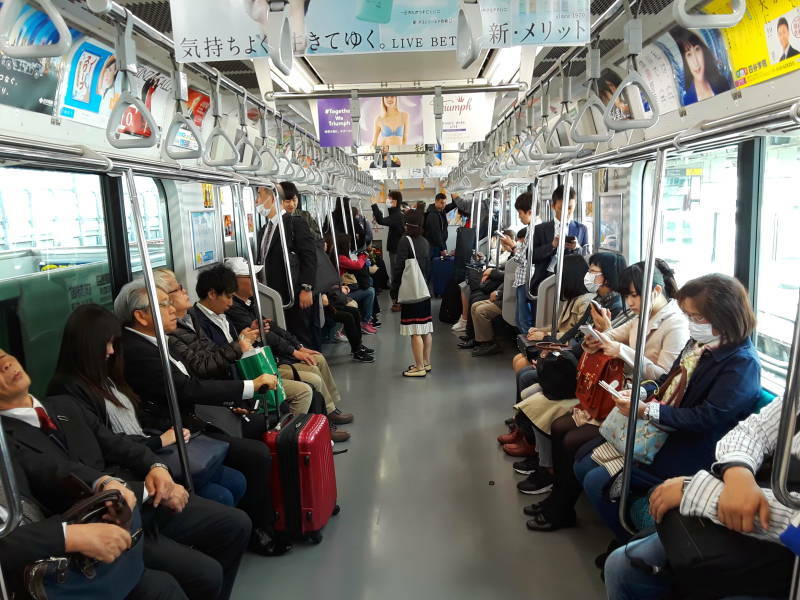 A Limited Express train would be the same equipment, but with fewer stops. You have to buy a supplemental ticket to ride a Limited Express. Avoid the Local, unless you're making a short trip, or you're going to such a small place that only a Local train stops there. 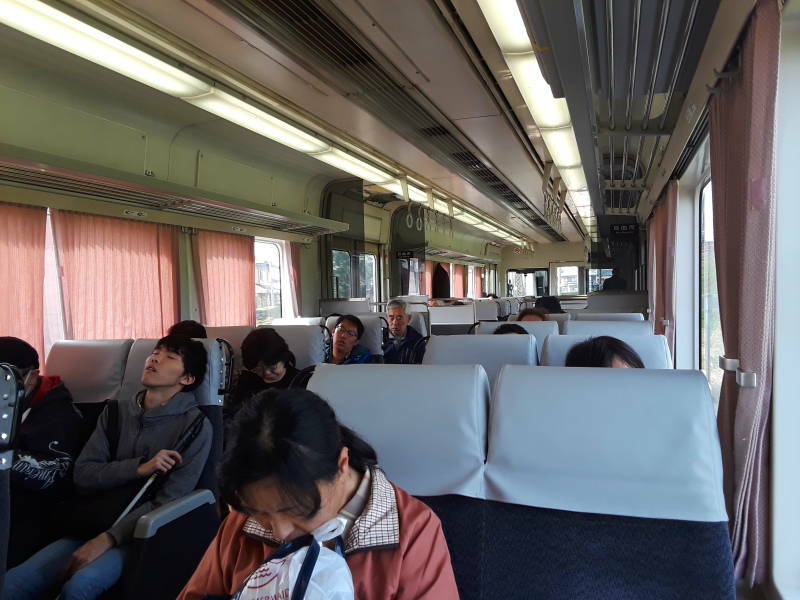 It was a quiet, restful atmosphere on board the Express to Ise. The scenery was a mixture of industry and agriculture. No flat land goes idle in Japan. Much of the country is rugged mountains, farm land is at a premium. 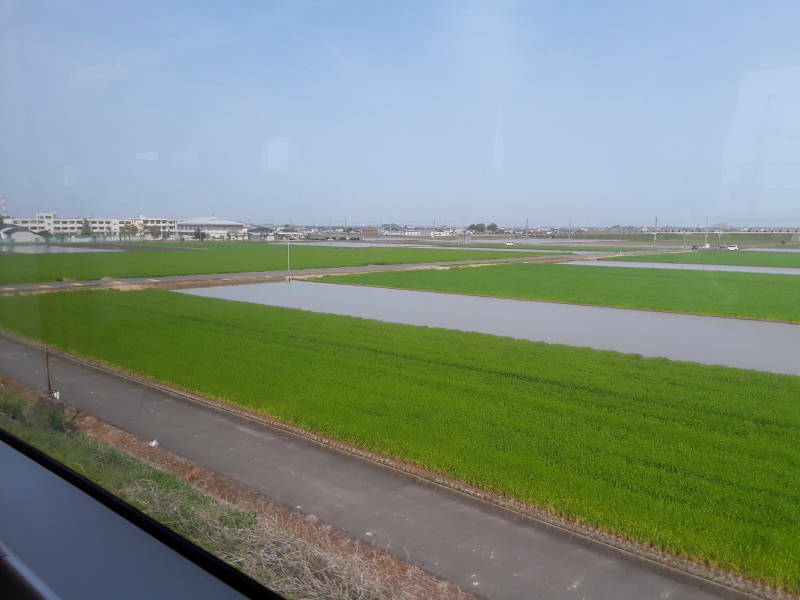 Much is planted in rice, as seen here.